My husband knows I like cherries, so he brought home a 3 pound bag of them. Three pounds! Pitting all of those is no easy feat, even with the overpriced cherry pitter tool I bought at Target, and as much as I like cherries, I wasn't so sure we could finish all 3 pounds of them before they went bad. Below is a recipe I found on Pinterest (originally published by Zerrin at Give Recipe). I put asterisks next to my additions and changes-- I like to personalize a recipe for taste and health. Mix cherries, sugar, almond extract* and cornstarch in a separate bowl until combined. Put a little crumble mixture in ramekins to make a bottom layer for your crisp. Spoon the cherry mixture into 4 ramekins and sprinkle the topping mixture evenly on cherries. 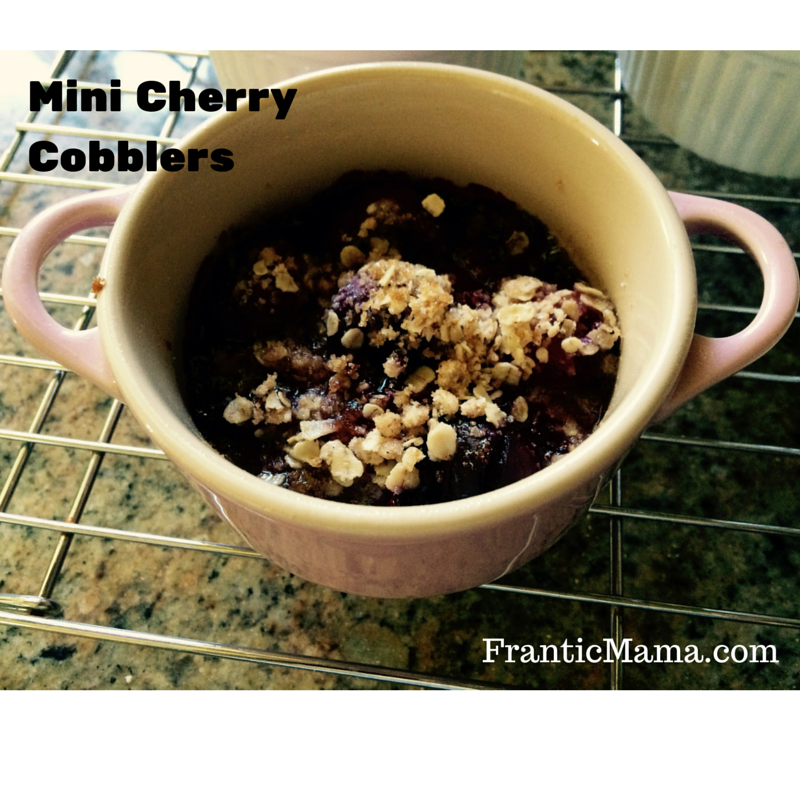 Bake for 30 minutes or until the topping is slightly golden and the cherry layer is bubbling. Baking is a hobby I used to enjoy frequently before having young wildebeasts children. Now it's more of a special event. Still, I'm excited to be back in it again a bit, if even just for the summer. What hobbies are you currently or do you hope to reconnect with when you are able? This is so scrumptious!! I love love love the color.cherries make everything festive!! And it feels amazing to get to do what we loved 'long ago' .How amazing? So amazing! Sounds crazy? It feels crazily fresh too doing something just because. still got some to spare?- whizz them with sugar and lemon,zest and all and coconut oil to the mostly smooth very slightly coarse consistency.A pink body scrub that beats all on the shelves.Sneak in a mini shower that will really be a tropical spa! I like it when you diy, it inspires me to find time too!! Ooooh a cherry coconut body scrub sounds amazing! The only problem is that I'd want to eat it :). Glad you liked the recipe. Let me know if you give it a try! Are there cherries available this time of year where you are? If not, I bet frozen ones would work well too. And yes, I feel SO refreshed when I take a bit of time to get back in touch with any aspect of my pre-mom self :). Cheap or Free DIY Updates for Your Home!